I don't know about anyone else, but certain types of foods just feel like they are a part of me. Of course I have a fondness for Southern things (Wilbur's BBQ anyone?) and for Korean. (Mmm, kimchee) But, somewhere there is a chromosome in my food DNA that makes me feel so happy when I have great Mexican food... Of course living in Phoenix for a year spoiled me rotten so when I moved home to Ohio I didn't think I would find anything as good as the local taco joints or the food cooked by my co-workers. Once upon a time when I used to work in an office downtown Columbus, a co worker and I walked down to the riverfront to visit festival Latino for lunch. Hellbent on getting tamales, we walked around until we passed this tiny little stand with three guys crammed into it. 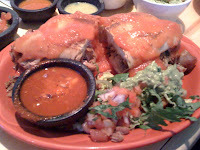 There we watched in what was first shock and then wonder as they crammed a Mexican style roll with juicy glistening carnitas, brilliant guacamole and proceeded to DIP THE ENTIRE SANDWICH IN HOT SAUCE. Well, it was love at first bite, and after I finished weeping with joy and the fire of the hot sauce I found out these guys had a restaurant. Tucked into a little strip mall on Henderson road, Cuco's sits, a still hidden gem despite raving reviews by the Dispatch and the Other Paper. It has been three years now since I first started going to Cuco's and when I found out my dear friend Jean had not had the pleasure of the experience, it was time for a visit. The thing that is so great about Cuco's is the way it has evolved. It has gone from a Mexican grocery with eight tables where local Mexican restaurant owners go for a dinner out to 20 tables with a single isle of groceries and a crowded table of soccer moms and children. The things that haven't changed: The homemade salsas for succulent tacos, the infamous hot sauce dipped Torta Ahogada and the family atmosphere amongst the staff. 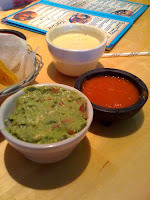 We started off the meal by adding a large order of the lovely guacamole and the nippy, but not to nippy queso dip to the complementary fresh corn tortilla chips and salsa. 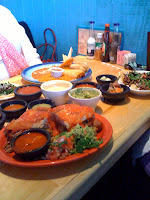 Next came the Torta Ahogada for me, Tamales for Ms Jean, and tacos for Mom. 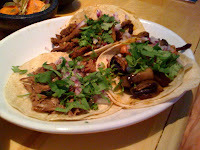 Now Cuco's tacos are soft, white corn tortillas with chopped red onions and cilantro on your choice of asada steak, carnitas, chorizo sausage, pork al pastor chicken, barbacoa, mushrooms, shrimp. (Whew! That's a list!) 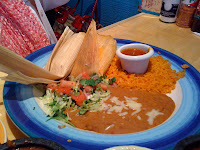 There are also Baja style fish tacos, fingers of freshly battered fish, shredded cabbage and mayonnaise dressing. Topped the way you like with salsas, and escoviche (pickled vegetables) from the salsa bar, three innocent little tacos become a serious meal. However, no meal is so serious that there isn't room for dessert. 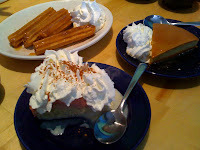 More specifically, flan, churros and tres leches cake for us, but if you like fried ice cream or sopapillas they have those as well. Open at 8 am (yes, they have breakfast and it is goood!) until 10pm, Monday through Saturday. 2162 Henderson Road (614) 538 8601. They have a full bar with killer Margaritas if you feel like getting a little crazy. Ohhhhh Man, I feel like a red-headed stepchild because I haven't been to this place yet. That will be remedied shortly ... Cuco's sounds really, really good!